Alkemy’s super fun, fusion wear is perfect for all you ladies looking to reinvent your look or for just a wardrobe upgrade. Plus, they do Ikat and Madhubani prints, meaning spring or fall, your look will be on trend. Fusion wear is all fun and trendy especially when the collection is something you can sport at brunches or strut to office in. Enter such a collection from Alkemy, a contemporary fashion house based out of Bangalore. Even though their Facebook page says that they contemporary clothing for both men and women, we didn’t come across any apparel for men. Having said that, ladies you are in luck because their collection of jackets, midi dresses, and tie-up dresses that feature pretty Indian prints are pretty much in stock and available up to and including size XL. The jackets are what we dig, all of them featuring Ikat and Madhubani prints and something that can be paired with your jeans and tee combo or if you want to add some zing to your boardroom look. Long sleeved and sleeveless options are available, with cotton fabric and juco fabric used to make them. Juco is a blend of both jute and cotton, in case you haven’t heard of it. 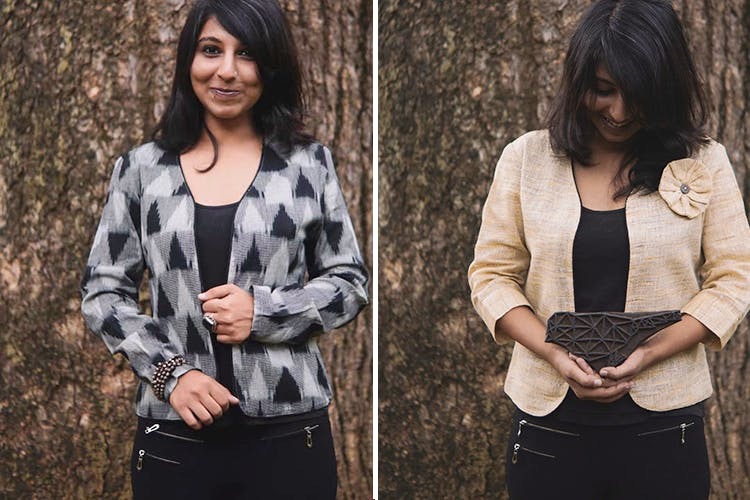 The Madhubani jackets are reversible ones, so you’ve got yourself two looks in one. If you browse through the range of dresses, you will find that they are perfect for that evening out with your girls or when you want to slay it at the next office party. But if you look closely, you will see that they are more than just perfect. They come with pockets, girls! Yes, actual pockets that can carry anything from small change to your phone. Hello, free hands and hello practicality. Ladies, this is where you need to be spending all your money. Jackets start at INR 1,900 while dresses start at INR 2,500. You can shop for the collection online here and they deliver pan-India.